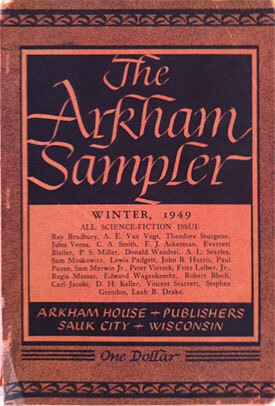 Arkham House, 1949; 100 pp. ; limited to 2000 copies. First Edition. This "All Science Fiction Issue" includes a symposium on "A basic science-fiction library"; "The Spring Night, a story by Ray Bradbury". ;"The Pool in the Wood, a poem by August Derleth; "Avowal, a poem by Clark Ashton Smith" plus eight other selections, books of the quarter, and editorial commentary. Book is solid and clean, pages are clean and bright. Cover front is clean and still attached, although loosely due to wear from opening and closing; there are chips on all four corners, along top edge, and top and bottom of spine; 1-1/2" tear along hinge at bottom; rear cover is clean, bright, and intact. Overall, this is a very good copy.